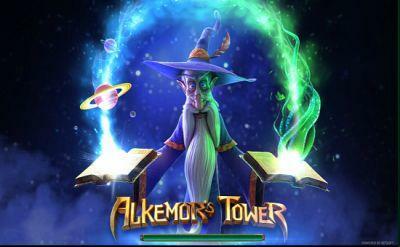 Alkemor is a wise old wizard who stands to the left of the reels in this excellent BetSoft designed slot. He lives in a tower and spends all day casting spells, the magic itself taking place on the reels. The Merlin-like wizard is accompanied by such symbols as spell books, ancient scrolls and amazing green crystals on the reels, in one of the most impressive looking slots you’ll find online. 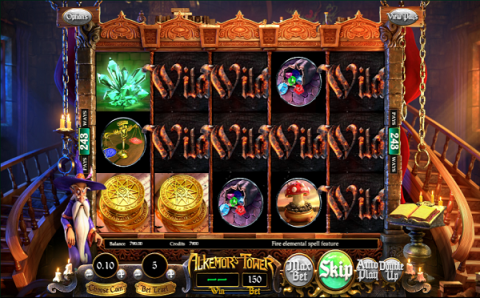 The highlights of Alkemor’s Tower include the four different spells that will have a huge impact on the reels and the free spins bonus round, where you’ll visit different floors of the tower. The amazing graphics would be a reason enough to give this 3D slot a top rating. Once you see the depth of the game play that goes with it, the ‘wow’ factor starts to kick in. US based players will find this game at www.bovada.lv – if you are outside of the US, then the very impressive (and very up to date) Rizk Casino www.drakecasino.eu has a great selection of BetSoft titles - alongside some quirky slots from Arrows Edge. The wide ranging bonus features of the game really set this slot apart. During the base game, you can win a great amount of additional wilds when Alkemor casts a spell, this activated by landing the spell book on reels 1 and 2, while also hitting one of the four elemental spells symbols on reel 3. Water Elemental Spell – This will see Alkemor summon a wave of water across the reels, turning all elemental and spell book symbols wild on reels 2, 3, 4 and 5, while the spell book symbol will now be turned into a random symbol. Any wins will be multiplied by the number of spell book and elemental symbols that triggered the feature. Earth Elemental Spell – Alkemor will now summon Meteors and rain them down on the reels. All the spell book and elemental symbols on reels 2, 3, 4 and 5 will now turn wild, while all of the other symbols will now be replaced completely. Air Elemental Spell – Now Alkemor will summon a giant tornado. Once again, all of the spell book and elemental symbols on reels 2, 3, 4 and 5 will turn wild, while all of the other symbols on the reels will now be blown around and re-positioned. Fire Elemental Spell – Alkemor will now send a huge ball of fire onto the reels. The spell book and elemental symbols on reels 2, 3, 4 and 5 will once again turn wild, but you’ll also find an added wild for each of spell book symbols on the reels – this possibly being the best spell of the four! You’ll also find two free spins features at the game, each of these once again activated by landing the spell book on reels 1 and 2, with the appropriate symbol on reel 3, which will transport to another floor of the tower. You’ll have 10, 12 or 15 free spins in total. The Nature Floor – The spell book with a vine wrapped around it will take you to this floor where you’ll see whole new flower based symbols on the reels. If a vine symbol appears on reel 3, it will devour neighboring symbols with an added reward for each. The Celestial Floor – The spell book with an ornate jewel on the front will take you to this floor, where you’ll see new planet based symbols on the reels. A black hole will appear on reels 2 or 4, and will, like the vine, devour its neighbors earning you a win for each one. The backdrop to the reels is the tower itself, with wooden stairs leading up to other floors in the background, while Alkemor stands next to the reels, talking occasionally and levitating at other times. All of the symbols appear in rich and deep colors, each one animating when forming part of a win line. This all makes for a truly enjoyable experience which is only added to by the perfect accompanying soundtrack. To win at this slot you’ll need to land symbols from left to right on consecutive reels, the all-ways system meaning that the symbols can land in any position on each reel. In total you’ll have 243 ways to win, but the cost of each spin is just 30 credits, although you can increase this to 60, 90, 120 or 150, while the coin value ranges from just 2c through to $1. The wizard himself is the top paying symbol in the base game, worth 1,750 coins for the maximum five in a row, with the green crystals and the gold coins next on the pay table. Alkemor’s Tower – What an Experience! If you were to design the perfect slot, you’d want rich eye catching graphics, great animation and a wide variety of original bonus features and fortunately Alkemor’s Tower ticks all three of these boxes. The game is enjoyable from the start and only gets better when any of the six bonus features kick in. The best of these are the free spins rounds where you’ll see new symbols on the reels and added extras, while the spells which add wilds to the reels give the game a spectacular feel when cast. Only a wizard could create a slot as good as this one! Check out the latest amazing 3D slots from BetSoft now, the place to head for this depends on your location. US Based Players: Head over to www.bovada.lv, where you’ll find all the latest BetSoft, Rival and RTG slots in one place. Non-US Players: A big shout-out for the fresh – www.drakecasino.eu where you’ll find 100’s of slot games (including BetSoft + many other major software houses).